Attacking midfielders play a vital role in modern football. They control the beat of the match and on most events, it is them who are the deciding factors of the game’s final outcome. Generally, these players are great passers of the ball as well as excellent dribblers. These two abilities allow them to cut through the opposition’s midfield and score from long range. In short, the best attacking midfielders are those who are well versed in finding a striker on the field, and make a timely assist which then converts into a goal. In a time that we live in, we are fortunate to have an opportunity to witness the wizardry of these attacking midfielders, and their superb passing abilities. 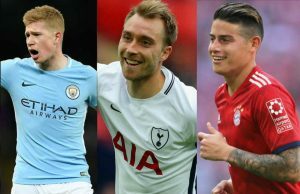 In this article, Allsportspk presents a list of top 8 most valuable and talented attacking midfielders in the current era, along with the reasons as to what makes them so essential to their team. James Rodriguez earned the 2014 World Cup golden boot and got his fantasy move to one of the greatest clubs(Real Madrid) on the planet; courtesy of some sparkling exhibitions in Brazil. Nonetheless, he had an intense time adapting in accordance with life at the Spanish club. And, any reasonable person would agree that James was unfortunate. Indeed, even in the wake of putting in great exhibitions, he was for the most part neglected by Real Madrid’s previous manager Zinedine Zidane. 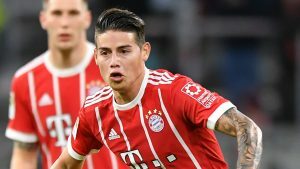 However, after James Rodriguez was given on loan to Bayern Munich, it was only then that he demonstrated his attacking midfield capabilities at the German club. The Colombian national reimbursed the confidence invested in him, by scoring 7 goals and assisting in a total of 11 goals from 19 Bundesliga (German league) games. Moreover, James was also the inventive center point for the Bavarians, as he made a total of 54 chances for the strikers. While Rodriguez had a poor shot precision of 52%, he positively compensated for it with a 90% accuracy in his passes. However, it was unfortunate for Rodriguez that he suffered from an injury and was rendered unfit for the World Cup 2018. At present, the Colombian is only 27 years old and chances of him becoming the fundamental midfielder at Bayern Munich are pretty high. His present value stands at €80 million, however Bayern Munich have a choice of getting him for €42 million, as the upcoming season will be his second year on loan with the German club. For #4, go to the next page!